Brighton’s Seedy Sunday has been a date in my diary for a while now. I went with 20-odd packets of seeds stuffed into my camera bag and not knowing quite what to expect. It is a big thing. You don’t usually see a long queue for a gardening event which isn’t a flower show, but there were about 100 people stood outside. Armed with empty bags. 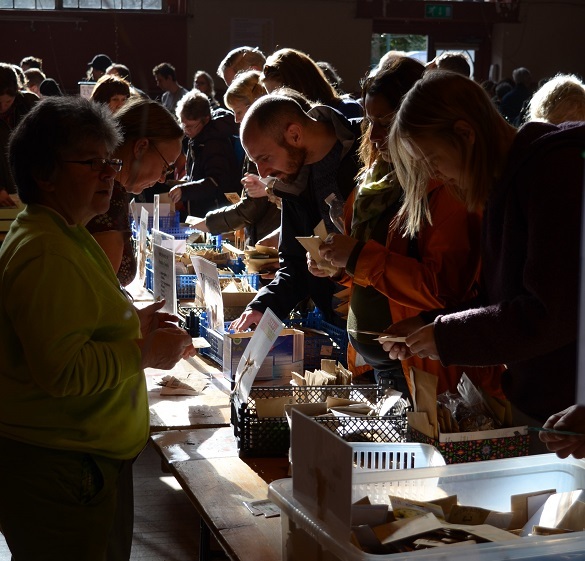 I am glad I arrived early, though it was a proper scrimmage around the massive seed swap table in the middle. At one point some parts were 4 deep… The squash seeds in particular seemed to be flying out and I wish I’d brought some of mine. 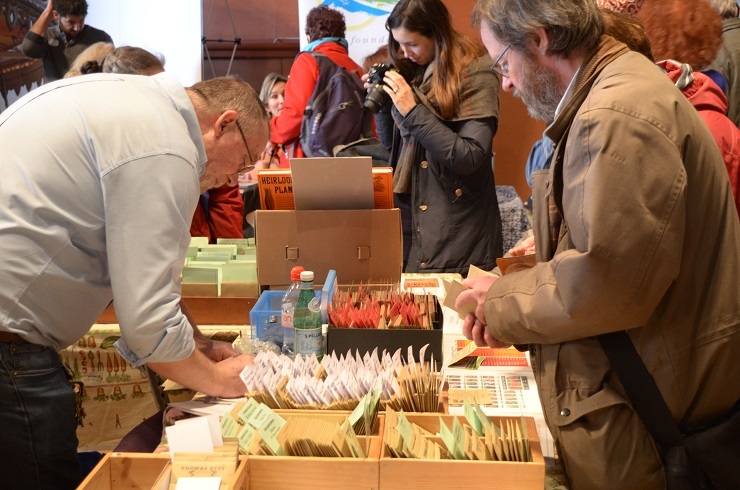 The deal is: seed packets on the swaps table are either 50p each (bargain!) or you swap with packets you’ve brought with you. 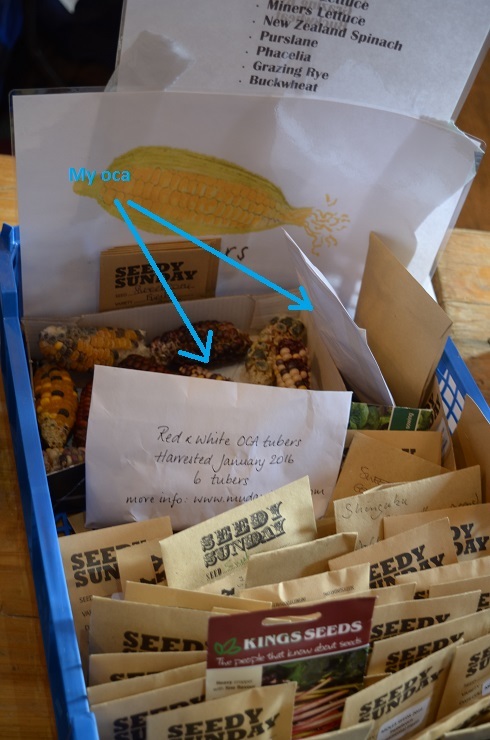 I took seeds with me that I hoped would be less common – Kiwano, white-seeded Lazy Housewife beans, Sandpoint and Blush tomatoes and some envelopes with red/white oca tubers. My web address is on the packets, in case whoever has them feels like stopping by. 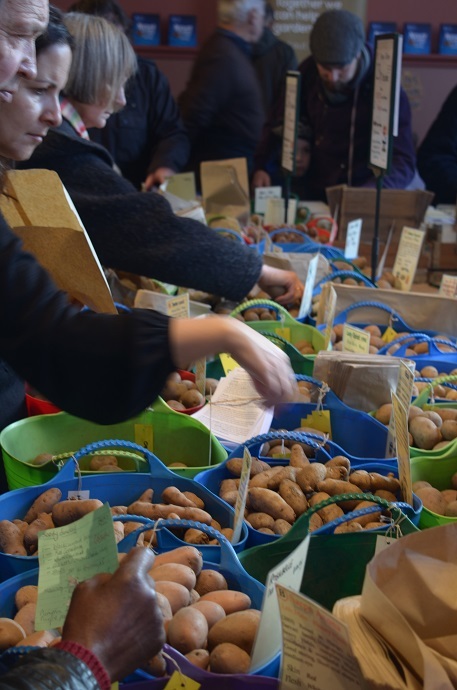 There were lots of other stalls – the Heritage Seed Library had a great swaps table, and there were other seed companies selling fresh seed , a huge variety of potatoes from Pennards and really interesting plants! In fact it felt bigger (and better) than the Edible Garden Show. It also had a really warm feel to it. I know I’m gushing a bit, but when I go to shows they can feel a bit standoffish. This felt more like a hug. It was great to meet both Rob Smith, whose mystery veg seeds I’m trialling, and Sean Cameron, who set up the Horticultural channel. Both properly lovely – with an unexpected Brucey bonus of some Elephant garlic from Rob. Some of the most exciting seeds came from Thomas Etty, to whose catalogue I need to pay a lot more attention! In a swap for some oca – capers (new greenhouse experiment!) and crapaudine beetroot which I have been looking for since reading about them on Leslie Mann Land‘s glorious website. Plus an interesting tomato and another packet of Fish chilli pepper seed because I Will Not Let Them Beat Me. I will get some of the little bleeders to germinate. Oh yes, I will. I’ve also got a yacon tuber. I wasn’t thinking to buy any this year, but the cunning women on the stall had some of the molasses it makes, and once I’d tasted it I was sunk! As well as the seeds & plants there were cafes, campaign & craft stalls, a local smith, and some great talks. I caught most of a really good session on local plant archeology and a fabulously pacey talk on plant nutrients by James Wong. I tried to take a decent picture of him from my balcony vantage point, but he’s a very energetic speaker and he just wouldn’t stay still! The full swag list is: Potatoes – 3 each of Sarpo Mira & Axona, Red Emmalie, 2 of Pink Fir Apple; one Yacon tuber; Chillies – Fish, Royal Black; Capers; Orach Red; Magentaspreen Tree Spinach; Beetroot – Crapaudine, Egyptian; Tomato – Berkeley Tie Dye, Lima Korai; Beans – Coco, Kew Blue, Lazy Housewife (tan), Pea Bean Inca; Wild Garlic; Pumpkin Munchkin; Lemon Cucumber; Swede Brora – of which the spuds, yacon and wild garlic were bought, the rest swapped. Plus Rob’s Elephant garlic. I don’t know whether all of it will/can be grown this year, but I’ll give it a really good go! Can’t wait to see what you grow! That would have been lovely. 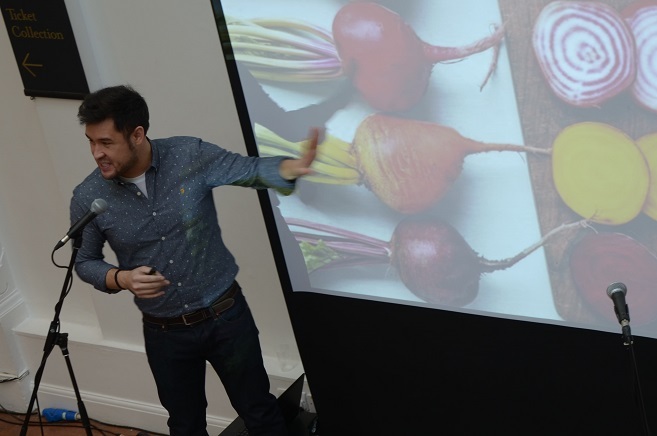 I really enjoyed James Wong’s presentation. And with the seed swap and the latest seed circle I’ve got to re-do my growing list! Sounds amazing! I went to a tiny seed swap yesterday too and came away with some chard, chicory, courgettes and cucumber seeds. Had some lovely cake and there was a Dutch couple playing a guitar and singing. Imagine I Believe I Can Fly in a Dutch accent! Fabulous! I see your Dutch guitarists and raise you an acapella choir singing next to a felting yurt…It’s well worth a visit – and am liking the importance gardeners place on good cake! Lots of non-seed stuff to do in Brighton…:) Though Himself still refused to come.